Happy St. Patrick’s Day! 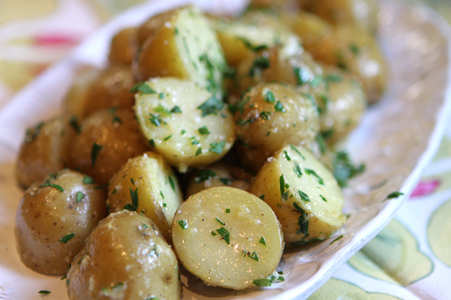 Few things say “Irish” more than potatoes. Bring a pot of water to a boil. Cut the potatoes in half, or quarters if they are larger. When the water is boiling, add the potatoes, garlic cloves and bay leaf, plus a good handful of kosher salt. Allow everything to cook for about 15 minutes or until the potatoes are done. Strain the potatoes and remove the bay leaf and pieces of garlic. Put the pot back on the stove and add the butter. When the butter melts, add the potatoes and give them a good toss to coat the potatoes in all of the butter’s tastiness. Sprinkle with your chopped herbs and a healthy pinch of sea salt. If you want a little more color, you can leave them in the butter longer for a crispier, more golden-brown skin.